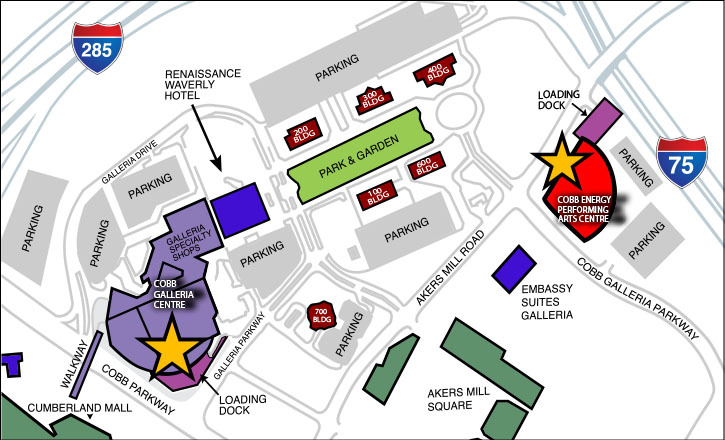 Click here to download maps of Cobb Galleria and the surrounding area. Northbound on I-75 (or coming from the Atlanta airport): Take Exit 258/Cumberland Boulevard. Go west on Cumberland Boulevard to the fourth traffic light at Cobb Parkway/US 41. Turn right on Cobb Parkway and go 7/10ths of a mile (6 traffic lights) to Galleria Drive. Turn right onto Galleria Drive. The Cobb Galleria Centre’s main (rotunda) entrance is located immediately on the right. An additional parking facility is located directly across Galleria Drive. Southbound on I-75: Take Exit 258/Cumberland Boulevard. Go west on Cumberland Boulevard to the fourth traffic light at Cobb Parkway/US 41. Turn right on Cobb Parkway and go 7/10ths of a mile (6 traffic lights) to Galleria Drive. Turn right onto Galleria Drive. The Cobb Galleria Centre’s main (rotunda) entrance is located immediately on the right. An additional parking facility is located directly across Galleria Drive. From I-285 eastbound: Take Exit 19/Cobb Parkway/US 41. At the end of the exit ramp turn right onto Cobb Parkway and move into the left-hand turning lane. At the first traffic light turn left onto Galleria Drive. The Cobb Galleria Centre’s main (rotunda) entrance is located immediately on the right. An additional parking facility is located directly across Galleria Drive. From I-285 westbound: Take Exit 20/Cobb Parkway/US 41. Continue to exit using the lane marked Cobb Parkway. At the traffic light at the end of the exit ramp turn left onto Cobb Parkway and go under I-285. Make a left hand turn at the second traffic light onto Galleria Drive. The Cobb Galleria Centre’s main (rotunda) entrance is located immediately on the right. An additional parking facility is located directly across Galleria Drive. Directions to the loading dock: Follow the directions above to Cobb Parkway. From Cobb Parkway traveling South turn left (turn right if traveling North on Cobb Parkway) onto Galleria Parkway. This is the traffic light just south of Galleria Drive and just north of Akers Mill Road. Then turn left into loading dock entrance. The Cobb Galleria has 1,800 self-parking spaces in three decks. A third deck is located directly across Galleria Drive. This parking deck has an underground tunnel on the 2nd level with direct access to the front entrance of Cobb Galleria Centre. Use this tunnel in order to avoid traffic while crossing the street and also to protect yourself from inclement weather. Two pay-by-plate parking areas on campus charge an hourly rate. There is no complimentary parking or validation in these locations. If you enter a parking area that does not have a gate, you may be in a pay-per-plate location. Please read signs carefully. Parking in gated decks is complimentary for the first 2 hours. After the second hour, a $5 daily rate will apply. Payment is by debit or credit card only. NO CASH is accepted. Parking is managed by Lanier Parking Solutions. Questions or need assistance? Call Lanier at 770.272.1865. Parking at the Renaissance Waverly Hotel (next to the convention center) and the Galleria Office Towers is subject to the prevailing rate charged by the hotel/office park and may be different than the $5 daily rate. Galleria parking is not permitted at Cumberland Mall or Akers Mill Square. Violators are subject to towing.